An introduction to AJ Puedan and the Warrior 2.0 Podcast. Who is the show for? It is for anyone who wants to better their life, who want to master their life. This show will be for people who are coaches, business coaches, consultants, life coaches and experts who help others because AJ’s stories will relate to those people. 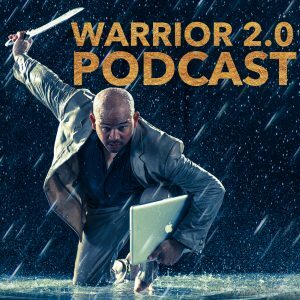 Heather Havenwood inroduces the producer of Warrior 2.0: The Evolution of Leadership podcast, AJ Puedan. AJ is a successful and sought after speaker. He is the author of 3 books. He is the founder and creator of Success Coach Academy. AJ has learned what long and short term for people in their ability to create the life they want–personal or business. He has taken personal development and moved it into the business arena. He trains people how to be speakers. AJ is the master behind many successful speakers you hear today. He has an ability to empower people to feel their own personal leadership. AJ started Warrior 2.0 to be the superhero’s superhero. He tries to help people define their own success, discover what’s in their way and then eradicate those things from their life. The podcast is called Warrior 2.0 because that mindset is very important. There are many different types of warriors. All warriors want to master every area of their life, provide for their families and master all aspects of their life. The podcast will talk about what makes people successful. Who is the show for? It is for anyone who wants to better their life, who want to master their life. This show will be for people who are coaches, business coaches, consultants, life coaches and experts who help others because AJ’s stories will relate to those people. Heather says people should subscribe because AJ has contacts that are priceless. AJ once wrote 120 sales presentations in one year and now has some major feedback on what is effective in life and business. Success Coach Academy is an organization that has spawned a community of people who work well together and support each other. AJ calls it a tribe. AJ describes the Warrior 2.0 retreat and how it works. AJ is the type of leader who empowers others to lead. AJ presents 3 principles that are important to the Warrior spirit: discipline, courage, and implementation.